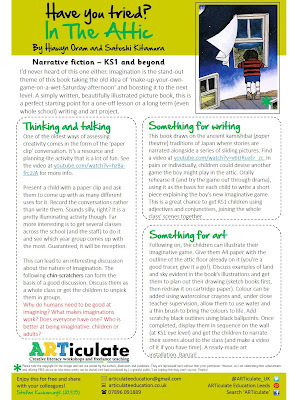 This week's bulletin features creative ideas for In The Attic by Hiawyn Oram and Satoshi Kitamura. It is a real gem and the perfect basis for a whole class literacy and art project. If you try any of the ideas I'd love to see the work your children produce. The boy has a million toys and is bored. So, he takes himself off up the ladder to the attic and finds a hidden universe that is full of unexpected creatures, doors to new worlds and a wealth of imaginative possibility. Funnily enough, his house does not have an attic. But maybe you just haven't found the ladder yet. 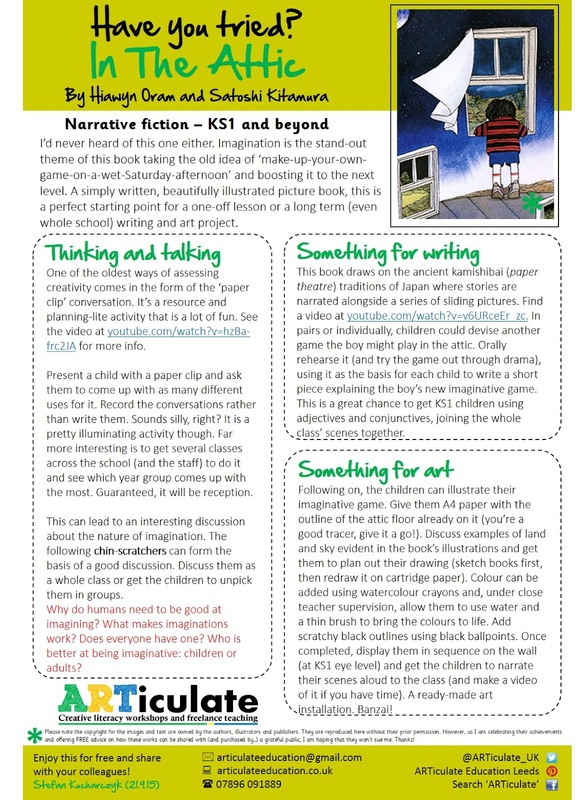 Ideas for talking and thinking: Demonstrate the power of imagination with nothing but a box of paperclips and maybe even show that Reception are cleverer than the headteacher in the process. Ideas for writing: Create a series of very simple pieces of writing that can be pieced together to form a new story. This draws on Japanese traditional story-telling methods. Ideas for art: Have children illustrating a Japanese paper theatre scene-show that they can present to the whole school!